Be aware that the dressiest fabrics can be the most frustrating to sew. Satin slides all over the place, chiffon unravels and puckers easily, panne velvet curls up along the edges, and lace… well, lace is full of holes. And I won’t even describe the horror of tulle. ;) You might want to start with easier-to-sew fabrics such as double knit, suiting, or "quilting" cotton. When you venture into the more difficult fabrics, save your sanity by choosing an easy pattern. 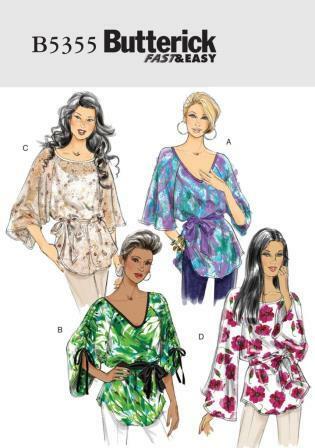 Butterick 5355 – a very easy pattern for loose-fitting pullover tops with wide raglan sleeves. View D would look ethereal and romantic in black lace or chiffon. 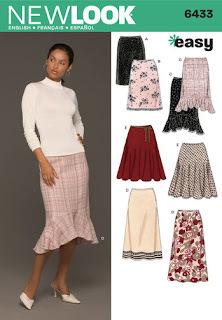 New Look 6433 – an easy pattern for several skirt styles. View B has a lace overlay, view C would look great with a lace or chiffon flounce, and view E would be a goth wardrobe staple in satin. Lol! SOOOOOO true. Excellent advice, using simpler fabric for complex patterns and simple patterns for tricky fabric. I just hate sewing satin or velvet!! !